Joe Pemberton poses with the Citizen of the Year award, which he received Monday from the Delaware Area Chamber of Commerce. Over the years, Delaware County has received numerous accolades for being a great place to live, and that fact isn’t lost on people like Joe Pemberton. On Monday, Pemberton was named Citizen of the Year by the Delaware Area Chamber of Commerce during its annual dinner and awards ceremony. While he said receiving such an award was a “humbling, humbling honor,” Pemberton simply wanted to talk about how great Delaware County is because of those who live and/or work in the community. He added paying it forward is “the foundation of our community,” and something he witnesses daily in Delaware County. In fact, as Pemberton looked out over the crowd, he noticed countless others deserving of the Citizen of the Year award. “So many of you right here in this room, if we were taking a poll, could or have been recognized with this honor. You are the ones that I look to,” he said. Currently vice president of community affairs for the Suburban Natural Gas Company in Lewis Center, Pemberton got his start with the company over a decade ago as public awareness program manager. After taking a brief hiatus from the company to explore the bright lights of Las Vegas, Pemberton returned to the company and Delaware County a few years back. Thanks to some guidance from Delaware Area Chamber of Commerce President Holly Quaine, Pemberton ingrained himself in the Delaware County community and never looked back. He added Riggle and Homan are two individuals who helped show him what it looks like to pay it forward. “There are so many dynamic and talented people here that make this phenomenal community what it is, and that’s recognized everywhere,” Pemberton said. He also noted the importance of the quality of education offered throughout the county, and the impact downtown Delaware has on attracting residents and visitors to the area. Upon returning from Las Vegas, Pemberton was eager to get involved in the community, so he sought out guidance from Quaine, a longtime Rotarian. “In addition to the Chamber, of course, I told him about Rotary. I told him that service clubs offer unlimited opportunities to forge relationships while serving in the community, and that if he cultivated them, he’d have friends for life,” Quaine said. Well, Pemberton took Quaine’s comments to heart, dove right in, and hasn’t looked back. “Joe’s enthusiasm, maybe from anybody else, would feel disingenuous, but from Joe, it’s so sincere it’s endearing,” Quaine said. “I have had the pleasure of volunteering at his side, and Joe will run circles around anybody and is absolutely indefatigable. He has one gear. Price, who introduced Pemberton on Monday, added this year’s Citizen of the Year recipient was a no-brainer. Along with his Rotary duties, Price noted Pemberton devotes his free time to helping local organizations like People in Need, Inc. of Delaware County, and the Strand Theatre and Cultural Arts Association, while also participating in numerous service projects, including working the gates during the Delaware County Fair. Before turning the podium over to Pemberton on Monday, Price noted Pemberton’s character is what sets him apart from others. 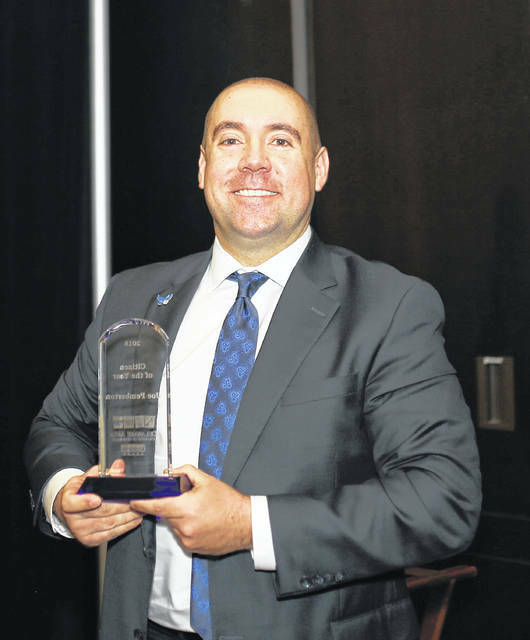 https://www.delgazette.com/wp-content/uploads/sites/40/2019/02/web1_Joe-Pemberton.jpgJoe Pemberton poses with the Citizen of the Year award, which he received Monday from the Delaware Area Chamber of Commerce.